This A-B-A Blown Film Extrusion Machine is basically a Blown Film Plant producing a THREE LAYER FILM but with the TWO EXTRUDER. It's a result of a specially designed A-B-A Type Co-Ex Die which enables to produce a Three Layer Film with Two Extruder. Technically in A-B-A type film, the Outer and Inner layer will be of the same Polymer as being fed by the same extruder and a Middle Layer will be of a different Polymer which will be fed by a second extruder. The cost of virgin (raw) material (HDPE/ LDPE) continues to go up every year, and therefore many packaging film producers equipped with co-extrusion blown film extrusion machines have started to make 3 layer (A-B-A) films to reduce cost, replacing the traditional single and two layer blown film extrusion machines to stay competitive in the market. 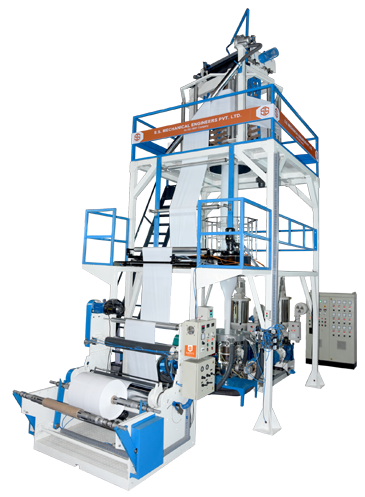 The A-B-A Blown film extrusion lines are manufactured to adapt to a broad range of applications. The plant is a rugged and compact model - very space saving. It comes with advanced technology like the grooved Feed Technology, PID Temperature controllers, and AC Frequency Drive. Max. Extrusion Output 120 Kg/hr. 125 Kg/hr. 150 Kg/hr.